Meeting and Agenda Management | Formark Ltd.
Formark’s Meeting and Agenda Management ContentLink module is designed for public sector usage, where the requirement to track decisions made in meetings is critical. In many public sector organizations, meeting content is stored within Content Server, yet the key decisions reached within a meeting are stored in emails, or buried within documents. To track the decisions taken in meetings to the related content requires a small army of people to navigate, collect, and organize. Formark’s ContentLink Meeting and Agenda Management solution has been designed to facilitate the preparation of a meeting agenda, the execution of the meeting and an infrastructure for insightful historical analysis of meeting outcomes. Through the use of an intuitive user interface and configurable meeting templates, ContentLink ensures that users don’t lose track of where they are, that they see only the valid and relevant meeting content and options at any time, and that those options pertain to the business at hand. Management Dashboards. 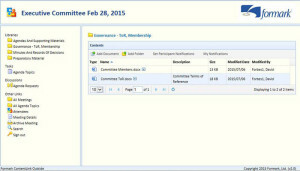 ContentLink Meeting and Agenda Management offers a number of dashboard options, presenting insight into upcoming meetings, open agenda topics and action items, and historical analysis for all meetings a user has permission to see. Simplified Content Server User Interface. The solution provides full access to a Content Server meeting workspace in a single screen that is optimized for usability. 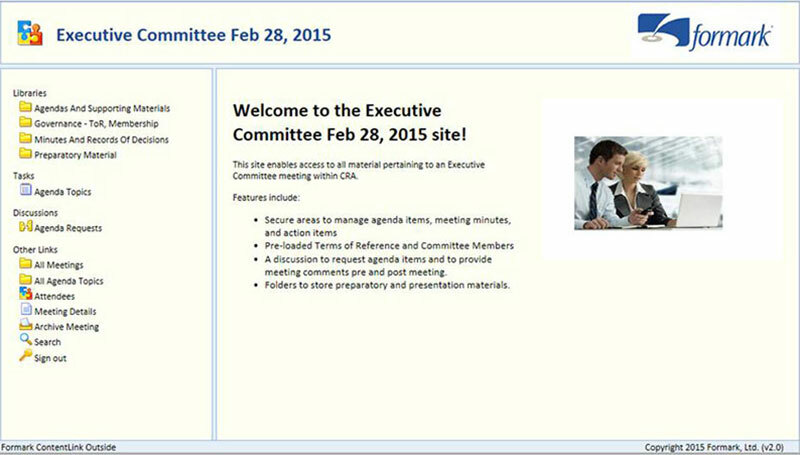 ContentLink Meeting and Agenda Management can be accessed on both tablets and laptops. All Content Server content, including documents, agenda topics, action items and discussions, are available for use, subject to permissions. “Quick Links” Navigation. A configurable “Quick Links” tree control presents important folders, discussion threads or agenda topics at a glance at all times. 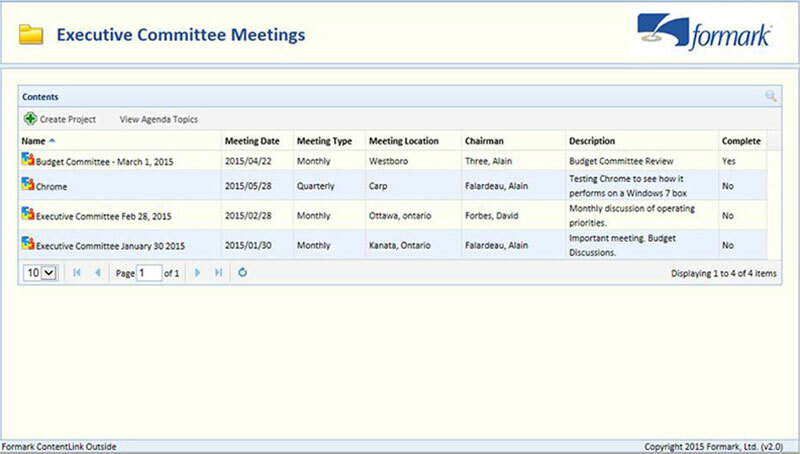 This feature makes it easy to access all relevant information relating to a meeting. Flexible Meeting Templates. ContentLink Meeting and Agenda Management can be configured to automatically create meeting workspaces with pre-determined content, agenda topics and presentation. This feature supports compliance to important business processes. Simplified Agenda Approval Cycle. ContentLink uses a workflow process to manage all agenda topic requests. 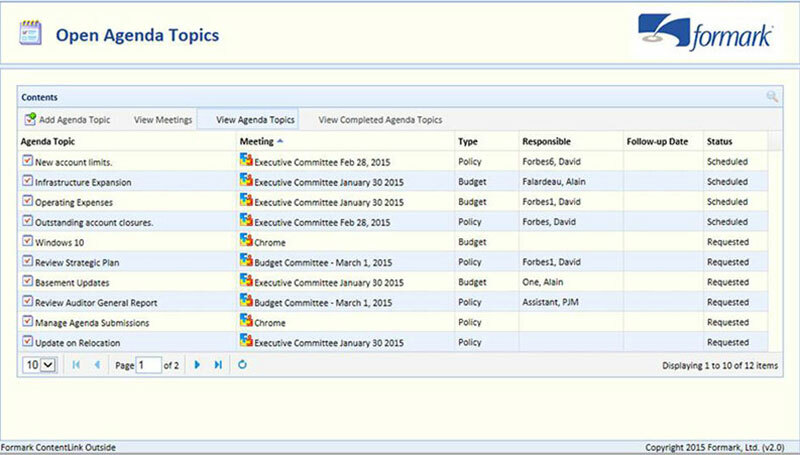 Only approved agenda topics are loaded into a meeting instance. Meeting Decisions are Captured in Real Time. With ContentLink Meeting and Agenda Management, all decisions are captured and categorized as they are resolved. 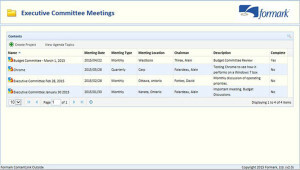 All meeting participants can see the status of every agenda topic and action item within the meeting and via dashboards. A Single Source of Truth. 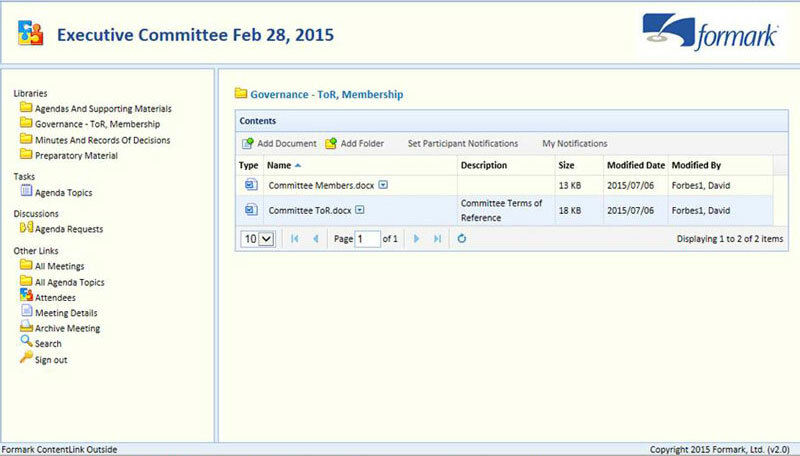 All meeting content, agenda topics and action items are maintained within Content Server. Gone are the days when incorrect information is presented or referenced in a meeting. Meeting Compliance Requirements. All meeting content, including agenda topics and action items are managed with Content Server’s Records Management module. Download a product overview of ContentLink Meeting and Agenda Management, an application that facilitates the process of effective meeting management. The following series of screenshots demonstrate the various states of Meeting and Agenda Management. Click on the images to enlarge. The following screen shot represents the Meeting dashboard. This dashboard shows all meeting that a user is invited to. 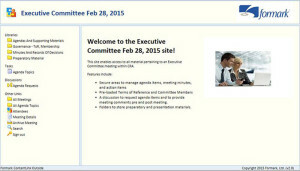 This screen shot shows a typical meeting home page. The welcome page is configurable for each meeting type. This screen shot shows a content contained in a meeting folder. Very simple user actions are permitted, requiring limited training. 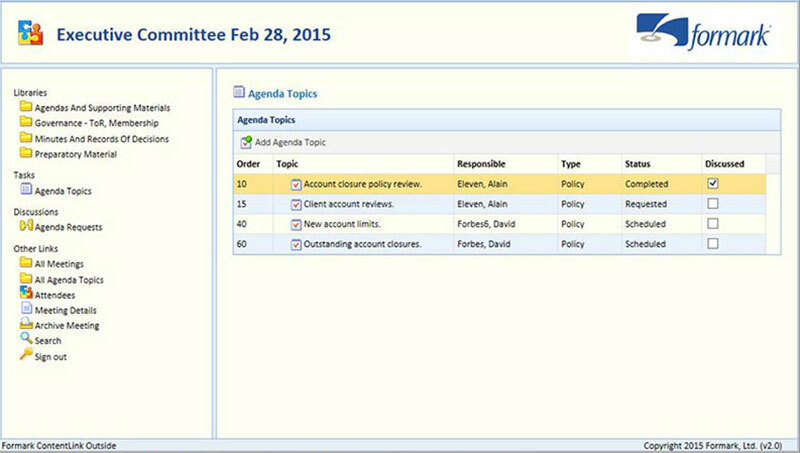 This screen shot shows a listing of agenda items for a particular meeting. Columnar agenda metadata presented is configurable. 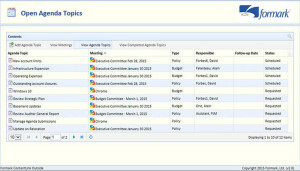 This screen shot shows a listing of agenda topics across multiple meetings that a user has been invited to. 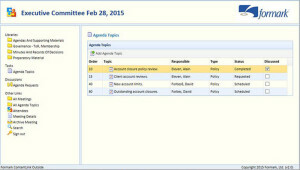 The application allows a user to search both agenda topic and action items across multiple meeting using different search filters.